This entry was posted in Cisco, GNS3 and tagged Cisco IOS emulation, download GNS3, GNS 3 and Cisco 1700 2600 7200 IOS in one pack, GNS IOS, GNS3, Graphical Network Simulator (GNS), How to Use GNS3, Network Simulator based on Cisco IOS. Bookmark the permalink. hey i am a Information technology student from india. i am a CCNA .i am interested in networking ,please tell me the things that i should look out for ,the things that i should learn. secondly,we have ns in our practicals.what is the basic use of this simulator ( ia have used some for CCNA)…howis this different.how powerful is this?? i m looking for iso images but i could not find. would you please mail me tha file on my account. GNS3 is just a front-end interface for Dynamips. and what is Dynamips? Dynamips is an emulator program that was written by Christophe Fillot to emulate Cisco routers. Dynamips runs on either Linux , Mac OS X and Windows and can emulate the hardware of the Cisco series routing platforms by directly booting an actual Cisco IOS software image into the emulator.It allows users to build complex network topologies to test the functionality of IOS on an desktop PC, without the need of an actual physical Cisco device (Wikipedia.org). you can search another IOS with Google keyword “intitle:index.of ios parent directory bin”. I am using GNS3 for my MAC OS X. I could not find the IOS image files. Will the same image files work for MAC ? if not, where can I find them ? can you simulate router in linux ? that mean : can we use PC to route packet like cisco router ? do you have the c3600 image ios ? please .. Excellent — was having trouble with configuring GNS since last couple of days. Turns out that I didn’t have the right images. This works like a charm. what r the most good ways to say thank you to anyone who help you?? i don’t know. so let me say in a common way. thanks. i have dowloaded it and want to try it. Something happened with rapidshare.com. Could you take somewhere else this file, because I couldn’t dowload it. Hello does anyone know which ios on which platform supports EIRGP ipv6 routing. Can someone help to find out the IOS for the netscreen for GNS 3 ? i was downlaod this software from this link but this softawre zip file protected by password so send me password. thx a lot.finally i found it. i think it’s very useful for me. FYI, *****You CAN’T emulate Cisco Switches***** in GSN3. But you can install the nm-16esw in some of the routers slots(Don’t know what that is then look it up). *Note* you won’t get all the functions of say a real c3550. But hay its better then nothing. Also search the torrent sites for the iso’s… there are huge packs with routers, PIX, ASA and IDS… Look people there out there! This had been the best, BOSON s*cks!!! Availing Software that is useless is kinda shi*ty! hi aziz thank u so much fr this help.. i hv a doubt that shud we mention odle pc value for every router or is it enough to mention it for one router….. plz help…. and can we directly ad this ios image or shud we decrypt it…..
Amazing Aziz…thanks a lot for your help. This would really make many Cisco certification aspirants’ life much easier. Visit the following site to download the uncompressed cisco IOS images. hw can use switch as a layer3 in GNS!!!!! As Mr. Aziz said, GNS3 is a great front end for Dynamips. Jeremy Grossmann, Benjamin Marsili, Claire Goudjil and Alexey Eromenko(all french men) are the main brains behind GNS3. I remember how much I struggled using Boson Cisco CCNA/CCNP software and Cisco Packet Tracer software to learn CCNA topics. But Boson and packet tracer are half baked and you cannot run all the Cisco IOS commands in these software. 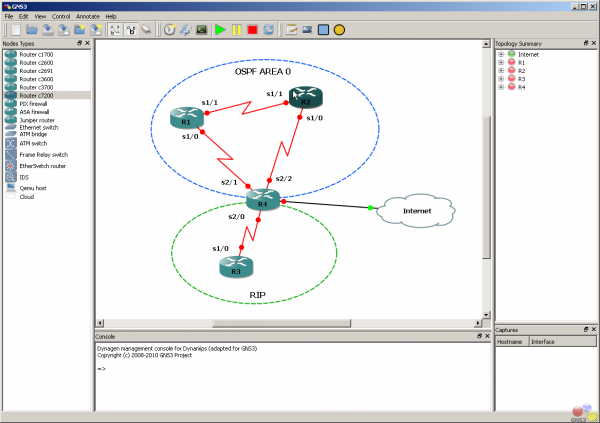 You can run Cisco Router IOS on GNS3 to practice CCNA, CCNP and CCIE routing lessons. Only trouble is GNS3 cannot run Switching part. You still need to depend Cisco Packet Tracer for CCNA CCNP Switching part and real Cisco Switches for CCIE Switching part. You can download files which you require for GNS3 from below links. You may need to register and sign in. I need asa5510 ios and sw2960 and sw3750 cisco ios image for gns3.please help me. can someone help me about the cisco 1721 ios image? where can i download it? Very useful information to work with GNS, Thanks a lot! friends. I’m sure they’ll be benefied from this website.